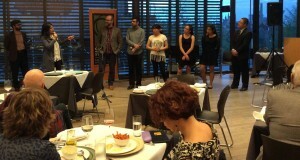 In last Friday’s Salon 21: The Regent Park Songbook, students from the Regent Park School of Music presented a series of new works – all settings of student-created lyrics by professional Canadian composers. The program featured works by Saman Shahi, Brian Current, Pouya Hamidi, Juliet Palmer, Emilie Lebel, Dean Burry, Aaron Gervais, Omar Daniel, and Jeff Ryan. Regent Park School of Music is a non-profit community music school which aims to give as many kids as possible a music education, by removing the financial obstacles. The Regent Park Songbook is an ongoing commissioning project that pairs young poets from the Regent Park School of Music with some of Canada’s best composers to develop new and exciting vocal repertoire for student musicians. In a Q&A following the performance, Soundstreams Artistic Associate Kyle Brenders had a chance to speak with the student performers about their experience taking part in this unique project, as well as RPSM Faculty Zorana Sadiq and Executive Director Rich Marsella. Zorana and Rich Marsella also spoke about the conception of the program, how its works, and future plans, as well as highlighted its significant impact on students. After all, the goal of the Regent Park Songbook is to create new Canadian vocal repertoire which students can relate to – songs for young performers, like those of the RPSM.